Depression affects nearly 10% of adults on average in the United States. Studies have shown that rates of depression for Americans have drastically increased in the past 50 years. Depression is a serious mental illness that is characterized by the relentless, overwhelming feelings of sorrow, hopelessness, and apathy. There is no one definitive cause of depression, but rather, it is a disorder that develops over time and can be triggered by a combination of factors, like stress and hormone fluctuations. It is important to be aware of the common symptoms in order to be able to identify depression and treat it during postmenopause. Postmenopause refers to the stage of a woman's life when menstruation has fully stopped, which occurs one year after their last menstrual period. In the United States, the average age at which postmenopause occurs is 51; however, it varies depending on each woman's genetics and lifestyle. Women ages 40 - 59 are most commonly affected by depression. This can be linked to the hormonal fluctuations experienced during the menopause transition. Estrogen significantly affects the brain's regulation of mood and emotions. Thus, women going through menopause are at higher risk of developing depression because their estrogen levels drop sharply and stay consistently low during postmenopause. Other factors that can trigger depression in postmenopausal women include retirement, the death of a spouse or loved one, and dealing with chronic illness. Depression in older people is often overlooked and left untreated because many people think it is a natural part of aging, a common myth that is still pervasive in modern society. It is important to be aware of the common symptoms of depression in order to detect the illness and seek treatment as soon as possible. Depression symptoms typically worsen if left untreated. They can be divided into physical and emotional. If you recognize these symptoms in yourself or a loved one, it is important to get professional help. Depression is a complex disease that often worsens over time, and unfortunately, does not usually go away on its own, it may need a medical treatments or maybe related to other health problem. Depression is a common, albeit serious mental illness. 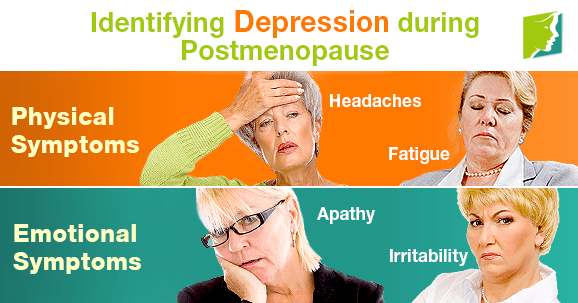 Women are likely to develop depression because of hormone fluctuations experienced during menopause. It is important to talk to someone about what you are going through. Staying active and getting regular exercise are known to help lessen depression symptoms because it releases serotonin and endorphins in the brain, which are known as the “feel-good” neurotransmitters.